Explore the latest interventions for improving functional mobility, strength, independence, and outcomes in acute care rehab. Designed for all practice levels, from the new grad to the veteran acute care professional, this hands-on course will provide you with an updated knowledge base for making appropriate decisions within the ICU and acute care environments, implement assessment and treatment tools, integrate existing treatment plans with progression into the plan of care, and adjust or accommodate treatment interventions across the hospital stay through transition out of the hospital. Discover the latest assessment techniques and learn how to integrate treatments into rehab plans during acute and post-acute phases. Practice the latest interventions, strategies, and best practices in hands-on labs throughout the recording. 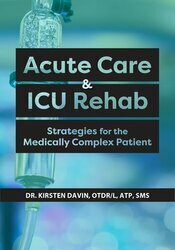 Dr. Kirsten Davin, OTDR/L, ATP, SMS, is a veteran Occupational Therapist of over 16 years with extensive experience in a variety of inpatient and acute care practice since obtaining her occupational therapy degree in 2001. She is best known for her live, national speaking tours, as she has conducted thousands of workshops and courses on the topics of splinting, seating/positioning, assistive technology, acute care assessment and intervention, and work/life balance. Kirsten received her Doctorate in Occupational Therapy in 2007, and graduated from the University of Illinois at Chicago in 2001. She was most recently named the 2016 recipient of the VGM HME (Home Medical Equipment) Woman of the Year Award, presented at the fall MedTrade conference in Atlanta, Georgia. Financial: Kirsten Davin is president of Escape Mobility Solutions. She receives a speaking honorarium from PESI, Inc. Non-financial: Kirsten Davin has no relevant non-financial relationship to disclose. Nurses completing these self-study materials will earn 6.0 contact hours. Expires: 9/28/2021. Iowa Nurses: PESI, Inc. is an approved provider by the Iowa Board of Nursing. Provider #: 346. Nurses successfully completing these self-study materials will earn 6.0 self-study contact hours. PESI, Inc. is an AOTA Approved Provider of continuing education. Provider #: 3322. This self-study course qualifies for 6.0 self-study contact hours or .6 CEUs in the Category of Domain of OT and Occupational Therapy Process. The assignment of AOTA CEUs does not imply endorsement of specific course content, products, or clinical procedures by AOTA. Course Level: Intermediate. Expires: 9/28/2020. Florida Occupational Therapists & Occupational Therapy Assistant: PESI, Inc. is an approved provider with the Florida Board of Occupational Therapy. Provider Number 50-399. This self-study course qualifies for 6.0 continuing education credits. This self-study course consists of 6.0 clock hours of instruction that is applicable for physical therapists. CE requirements for physical therapists vary by state/jurisdiction. Please retain the certificate of completion that you receive and use as proof of completion when required. California Physical Therapists & Physical Therapist Assistants: PESI, Inc. is recognized by the Physical Therapy Board of California as an approval agency to approve providers. This self-study lecture qualifies for 6.0 continuing competency hours. Illinois Physical Therapists & Physical Therapist Assistants: PESI, Inc. is a Registered Physical Therapy Continuing Education Sponsor through the State of Illinois Department of Financial and Professional Regulation, Division of Professional Regulation. License #: 216.000270. This self-study course qualifies for 6.0 CE credit hours. New York Physical Therapists & Physical Therapist Assistants: PESI, Inc. is recognized by the New York State Education Department, State Board for Physical Therapy as an approved provider for physical therapy and physical therapy assistant continuing education. This self-study course qualifies for 7.2 contact hours. Texas Physical Therapists & Physical Therapist Assistants: This self-study activity is provided by the Texas Board of Physical Therapy Examiners Accredited Provider #2106032TX and meets continuing competence requirements for physical therapist and physical therapist assistant licensure renewal in Texas. This activity will provide 6.0 CCUs. The assignment of Texas PT CCUs does not imply endorsement of specific course content, products, or clinical procedures by TPTA or TBPTE. Full attendance is required; no partial credits will be offered for partial attendance. This self-study activity qualifies for 6.0 clock hours of instructional content as required by many national, state and local licensing boards and professional organizations. Retain your certificate of completion and contact your board or organization for specific filing requirements.